With one of the busiest transport hubs in the capital in its midst, London’s Victoria is a name that is recognised throughout the country. This part of London is different in many ways to the rest of Central London, as it still has some relatively quiet spots that sit alongside some of the most hectic parts of one of the world’s greatest cities. As one might expect, this region of London is named after Queen Victoria (albeit indirectly) and it covers the area between Vauxhall Bridge Road, Grosvenor Gardens, Wilton Road and Buckingham Palace Road. The area has some of the most iconic theatres outside of London’s West End, including The Apollo and Victoria Palace Theatre, which has been on the same site since 1832, despite being rebuilt three times across that period. Victoria is also home to Westminster Cathedral. The roman catholic place of worship has been there since 1903 on the site that was once Tothill Fields Prison. Close to the cathedral is the secondary school, Westminster City School for Boys and its sister school, Grey Coat Hospital for Girls, is a mere five minutes’ walk away. They are the two main state schools in the area, but Victoria is also home to the renowned independent school Westminster, which is situated in Deans Yard towards Westminster Abbey. As part of the wider Westminster area, Victoria has a steady and stable economy. Many major businesses now call Victoria home, but it once had the label of “Government and God” as it was home to so many civil service buildings and places of worship. The austere grey façade of much of Victoria Street is slowly being taken over by more modern buildings, and the area is becoming more and more attractive to a whole host of sectors looking to capitalise on the district’s valuable SW1 postcode. Around £2 billion has been earmarked for the development of offices in the area over the coming years and that figure is expected to be matched on infrastructure improvements too. This will push Victoria to the fore and transform the area from drab to fab as we move into the 2020s. Proof that the transformation is already underway can be seen by some of the major fashion houses that are already snapping up property in the area. Giorgio Armani now has his UK headquarters here, and others such as Burberry, Tom Ford and Jimmy Choo all now have a presence here as well. For many, Victoria only means one thing – transport. This is one of the busiest and largest transport areas in London, and future improvements look set to keep it that way. 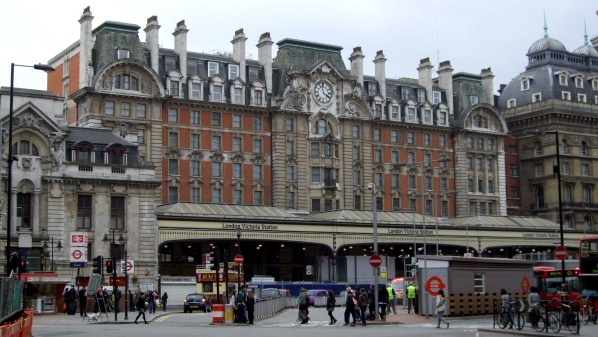 London Victoria station served an astonishing 81 million passengers between 2013 and 2014 and is second only to Waterloo in terms of passenger numbers. However, Victoria’s connection to transport does not stop with the railway. The area also has a large coach station just minutes from the railway connection as well as a large taxi rank for London’s Hackney Carriages. Future proposals for the area include a connection to the already popular Docklands Light Railway (DLR) and there are also plans for a new stop at Victoria to be included on the upcoming Crossrail 2 project. As a company working in Victoria we can testify that business is definitely on the up in this part of London, and they have already secured the financial backing to take their plans into the stratosphere. Over three million square feet of residential, commercial and office space is expected to be added in the next decade and the transformation of Victoria Underground Station is already being heralded as the new King’s Cross. This transformation will bring in new and exciting companies to what is already a part of London being noticed by big business. Governmental buildings are now being moved away from the area, making room for the new wave of business opportunities that will undoubtedly raise the profile of this once overlooked section of the capital. Victoria also has its own Business Improvement Development scheme in place as well. The business funded and business-led project aims to represent the growing number of organisations in the area, making this part of SW1 a better place to do business both now and in the future.